Anthocyanins are also naturally expressed in blood oranges.This variety of orange need cold temperatures to develop a vibrant red color, so they currently cannot be commercially grown in the subtropical climate of the Florida citrus belt. These purple Key lime are the first step toward producing blood oranges that can be grown by Florida farmers. 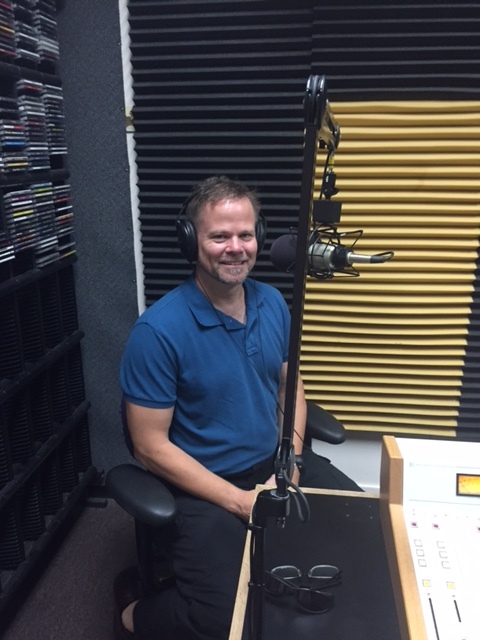 UFHortSci professor and Chair Dr. Kevin Folta speaks with NPR in Miami about agricultural biotechnology. 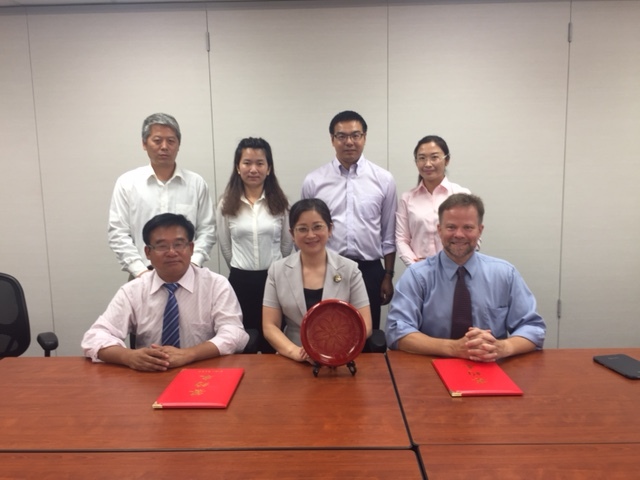 Scientists from Shanghai Academy of Agricultural Sciences signed a key collaboration agreement with the University of Florida’s Horticultural Sciences Department. Both institutions have strong interests in breeding strawberries and peaches, and in their diseases and postharvest care. The agreement strengthens bi-national opportunities for both groups and facilitates the exchange of scientists and students for research experiences in foreign laboratories. Three new blueberry cultivars created by UF Horticultural Sciences professor and blueberry breeder Jim Olmstead have been approved for release. The new cultivars, named Avanti, Arcadia and Endura, were created for evergreen production, meaning fruit production is possible from late January through May. They are expected to produce higher yields than existing cultivars, which are not as well adapted to the evergreen management system. They are also some of the only blueberry cultivars in existence that can be grown successfully in central and south central Florida, where 50% of the Florida’s blueberry production occurs. The release of these cultivars will provide Florida blueberry farmers with the new opportunities for industry expansion. The UF Horticultural Sciences department recently hosted the Florida Agriculture Biotechnology Literacy and Communications Day. This conference was intent to teach scientists to effectively communicate their ideas in a time when public distrust of science and technology is at an all time high. Plant biotechnology, oftentimes referred to as “GMO technology”, has been safely and effectively used in agriculture for almost two decades. Many new products await approval and could have profound positive impacts that benefit the environment, the needy, the farmer and the consumer. However, public distrust of the technology slows application and invites prohibitive rules and policy changes. The divide between the science and the public perception is caused by inadequate communication about the technology. This workshop featured speakers like Washington Post journalist Tamar Haspel, Biofortified co-founder Karl Haro von Mogel, and other experts in biotechnology and communications to discuss how to connect with a concerned public looking for answers in this area. Drs. 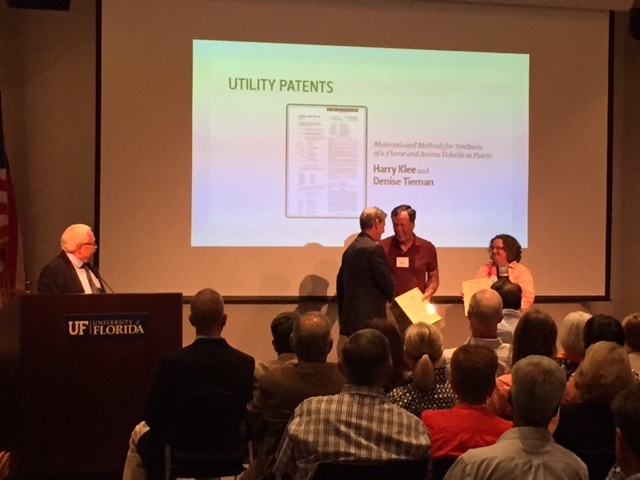 Harry Klee, Denise Tieman and Balasubramani Rathinasabapathi from the UF Horticultural Sciences department were honored on May 19 at the 8th Annual UF/IFAS Award Ceremony. Drs. Klee and Tieman were recognized for their patent on an enzyme that synthesizes some of the most important flavor volatile compounds in a tomato fruit. One of those compounds, 2-phenylethanol, is the most widely used flavor and fragrance chemicals. The only natural source of 2-phenylethanol is extraction from rose petals, so even though it is synthesized by the ton industrially, it is extremely expensive. Understanding the natural synthetic pathway opens up possibilities to enhance its production in plants. Dr. Rathinasabapathi was honored for his research on understanding how plants adapt to stress. Based on their discoveries about gene function, Dr. Rathinasabapathi’s and his colleagues have been issued utility patents to improve crop plants tolerance to high temperature stress. In their recent research, they have successfully improved rice plants’ tolerance to high temerpature stress using a gene encoding glutaredoxin protein.